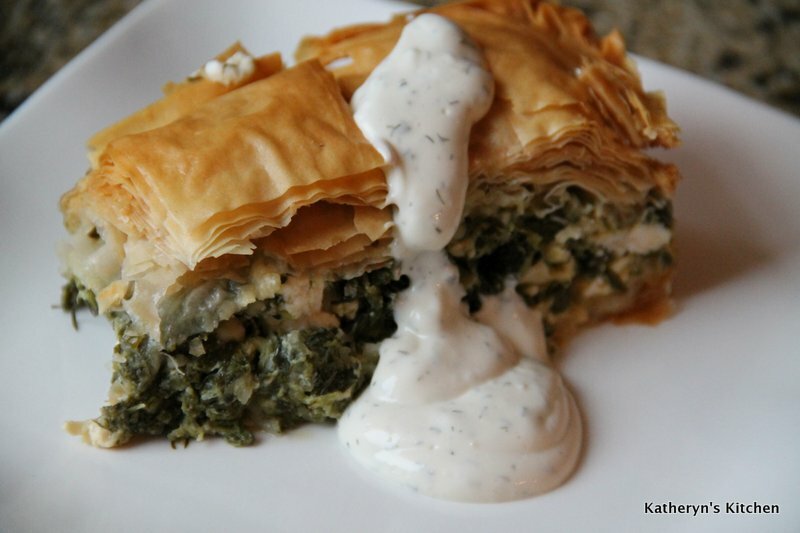 When out for dinner, and if on the menu, my husband Ray will order different variations of a spinach and feta pie. He was my inspiration for this recipe. I found a number of recipes online, so adapted this recipe from those, to appeal more so to our tastes. I used a light or non fat version of all the cheeses and prefer using melted butter. Some use olive in place of the butter but I don’t favor the flavor olive oil imparts. I hope you enjoy it. It can be served as a light dinner, lunch, appetizer or side dish. 2 pounds of frozen chopped spinach with all the liquid squeezed out. 1 cup of melted butter to brush on the baking dish, Phylo layers and to sauté green onion in. Pre-heat the oven to 375 degrees F. Squeeze out all the water in the thawed chopped spinach. Use cheesecloth to do a thorough job of it. It’s imperative not to have any excess water in the spinach or you will have a soggy crust. Over medium heat sauté the chopped green onions in 2 tablespoons of melted butter until translucent, about 4 minutes. Transfer onions to a large bowl adding fresh dill, spinach, feta cheese, cottage cheese, parmesan cheese, beaten eggs and salt and pepper. Mix gently, do not over mix, you want the feta cheese to stay chunky and not break up too much. Prepare the Phylo dough. 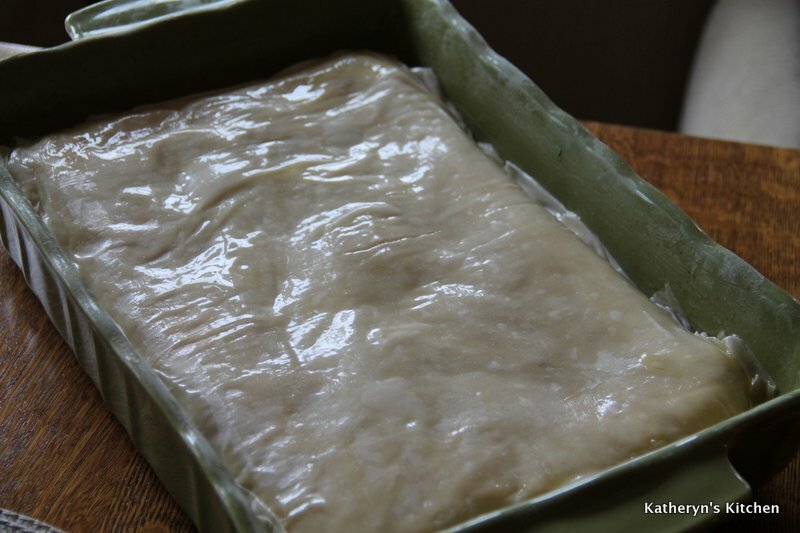 Take out of packaging, unroll and cover with a slightly damp tea towel so that the dough does not dry out. 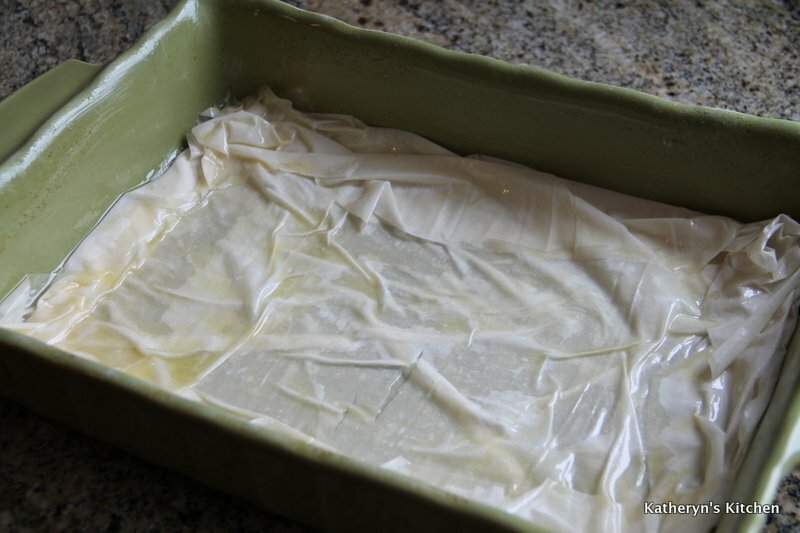 Lightly butter the 9 X 13 baking dish with a pastry brush. Add 5 layers of Phylo dough to the bottom of the buttered dish, brushing each one individually with melted butter, just before you layer on the next one. When layering on the Phylo dough sheets, don’t pull tight, lay down in a wavy fashion, so that there is some texture between the layers. 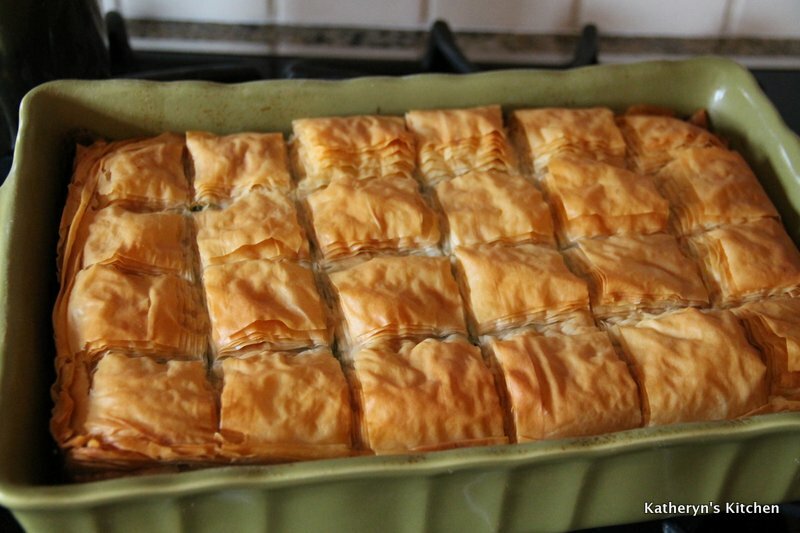 After layering the Phylo onto the bottom of the dish, add all the filling, smoothing out into an even layer. 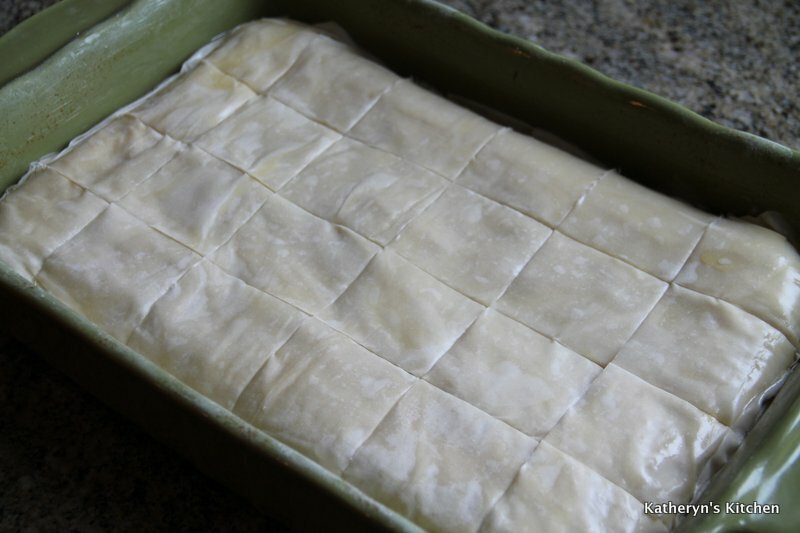 Now layer the Phylo on top of the filling. Use 10 pieces, layer on and pull tight, then tuck each piece down around the inside edges of the dish around the filling. Use a spatula or dull knife to help with this. When adding each layer be sure to brush each with melted butter. Continue doing the same thing until all 10 pieces of Phylo are used. Now using a sharp paring knife, score 4 even lines lengthwise down the Phylo, about 1/2 inch deep. Now in the opposite direction, score 6 even lines, to give you 24 even sized squares. Bake for 1.5 hours, until the top is a deep golden brown. Serve warm or at room temperature. We like a little homemade Tzatziki sauce on the side.